Anthony Wells calculated what the election would have looked like on the new boundaries what the election would have looked like – the notional 2015 result using the previous (600 seat) new boundaries would yield results of CON 322 (-9) LAB 204 (-28) SNP 50, LIB 4 (-4), a notional Conservative majority of 44 compared with their actual (official) majority of 12. But if the boundaries are redrawn on the basis of 650 rather than 600 seats, that almost invariably changes things. We obviously can’t calculate a notional 2015 result on revised boundaries without knowing what those boundaries actually are. But we can estimate the impact by assuming that the new boundaries are drawn such that the electorates are of equal size (or at least, the same average size for each party’s seats), and further that there is no net “gerrymander” effect (ie once the sizes are equal, the way the boundaries are redrawn doesn’t on average favour anyone). I’m also going to ignore the complication of the tiny number of “protected” seats. The results would then be CON 340 (+9) LAB 226 (-6) SNP 55 (-1) LIB 7 (-1), a Tory majority of 30. The reason for the discrepancy is likely to be that having more, smaller seats should (all else equal) result in a more proportional result. In reality, the impact could be even smaller, because boundaries will be redrawn based on 2015 data – which by 2020 will already be 5 years out of date, something which almost always hurts the Conservatives and helps Labour, due to the trends in the sizes of the respective electorates. 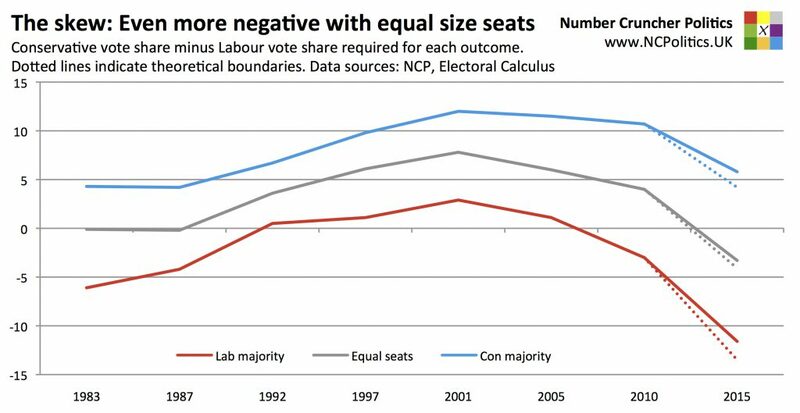 Note also that the negative skew doesn’t mean that the boundaries now favour the Tories. Conservative-held seats are still (on average) bigger than Labour seats. But this is now more than offset by distributional efficiency – Labour now pile up votes in safe seats in the North of England and lose seats on substantial vote shares in Scotland, while the Conservatives no longer waste large numbers of votes by losing contests with the Lib Dems.